Ten thousand Americans turn sixty-five every single day. Many of these people are- or will be- taking care of their elderly parents in some fashion or another. What’s more, the elderly population is projected to increase such that by the year 2020, twelve million older Americans will require long-term care services. In addition to three decades of experience in counseling individuals and families, author & advocate Margo Arrowsmith learned about parent care in a more personal way by caring for own parents. Margo gained first-hand experience with many of the same challenges adult children face every day. She learned quickly that even an experienced family counselor needed resources and guidance in a variety of areas, in order to keep parents and other family members as healthy and happy as possible. In a short amount of time, it became obvious that keeping parents in a home-based environment whenever practical is the best course of action, for a variety of reasons. Now, Margo’s mission is to keep one million more elderly people at home in happy families. Through her book You Can Keep Your Parents at Home and related activities, Margo helps adults make important decisions for their elderly parents’ future. In addition to her writing, speaking, training and consultation services, Margo is also assembling the Keep Your Parents at Home team to grow and expand this movement and to fully utilize the power of passionately driven people to make a tangible positive difference in the lives of families throughout the country. In addition to all of the free resources on our website, the KYPH Member Section provides additional information, access to our KYPH video content and access to KYPH counselors, conference calls and activities. Simply click to the badge above to sign up. Or contact us by filling out the form below, for more information or to ask your most burning question. 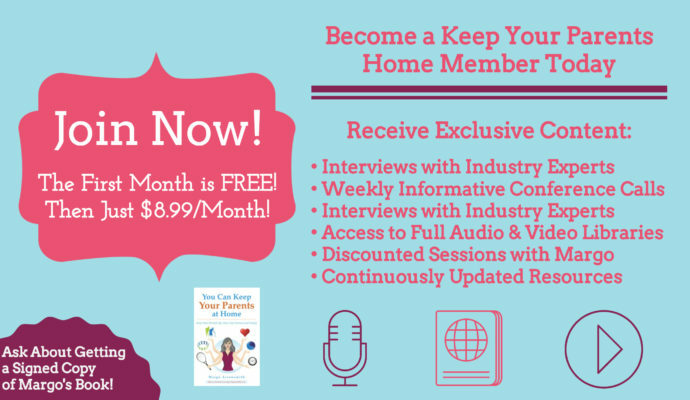 You Can Keep Your Parents at Home is designed to serve as your road map and guide to allow you to keep your parents in-home as they age. Margo wrote this book and developed her L.O.V.E. program based on her personal experiences, as well as years of training and counseling work. To learn more about the book or purchase a copy, please click here. Margo realizes that her mission is a challenging one and that she cannot achieve it alone, so she is always looking for opportunities to train allies in her cause. Those who are interested in spreading this important message, but may need some guidance about the best way to communicate it are encouraged to click here to learn more about Margo’s training opportunities. As part of her mission to keep 1 million aging parents grow old at home, Margo loves speaking to large groups. She can travel across the country to speak to a variety of groups involved in the aging process, including like-minded people who need guidelines for their personal journeys, construction organizations building to help people age in place, financial advisers, and many more. To learn more, or request Margo as a speaker, please click here.